Gemini | Geminis are a mix of the yin and the yang, they are represented perfectly by the Twins. The Gemini-born can easily see both sides of an issue, a wonderfully practical quality. Less practical is the fact that you're not sure which Twin will show up half the time. Geminis may not know who's showing up either, which can prompt others to consider them fickle and restless. Gigi is no longer a ‘baby in need’. She’s now a tortie in her terrible twos, just ask our other animals. She’s so pretty. She has gained weight and is growing so tall. It’s hard to believe she was on the verge of death when she found me. When the day starts dawning, she’s up and at it. She’s running through the house, jumping on my leg if I don’t get her food fast enough, jumping on the dogs and cats. She’s so happy. I tell others, I can’t correct her because she’s just so happy to be alive! She runs around herding the dogs into one room. She then sits in the door way to make sure her dogs stay in place. When she’s tired of making the dogs stay, she then goes after the cats. She will run up to them, put her paw up to slap them and the older cats will make all sorts of warning cries. They will turn to run and the race is on. Gigi’s goal, to run them both outside. Once she gets them out, she’ll sit on the other side of the doggie door and slap them every time they stick their head in. (She will also do this with the dogs if she catches one outside.) It’s so funny to watch. Grin. She usually does her work from 6am – 10am and then again around 4pm-bedtime, usually around 9pm. During her down time, she sleeps on her Pooh Bear binkie I gave her which covers up a soft pillow. Yes, I have her spoiled. How can one be mean to such a sweet face? She has taken to sleeping against, and sometimes on, my feet. She has literally taken Chuey’s place. She sleeps on me the very same way Samson used to. Her sleeping position is greatly appreciated on my behalf. I still miss my Samson. I don’t guess I will ever stop missing him. Here’s to my herding, foot warming cat! I would like to introduce you to our third cat and second tortie, “Lady Gigi”. Thursday night on October 13 (2016), I heard a noise on my front porch. I jumped up and was getting ready to fuss at Miss Bubbles (she has a habit of going out back and coming around to the front door and knocks to come in). When I yanked open the door, there was this kitty. She had been jumping up and down to get anything she could find out of our trash on the front porch. I quickly shut the door and told my momma it wasn’t Bubbles, it was a kitten. I eased the door open, walked outside and called her to me. Initially, she ran. I then eased back and she ran straight to me. I almost died! She was nothing but skin and bones. I took her inside. My parents fell in love with her immediately. I just couldn’t imagine such a young kitten on her own. I gave her a little bit of Maebelle’s food. It’s in a pate form. The kitten just ate it up so quickly. I gave her a little more and she ate it in a second. I managed to get her into my arms to look into her mouth without her biting me, again! (Yes she bit me. She smelled the food I had just fixed her on my finger). She had her adult teeth and her mouth was ash white. I knew she would die if I didn’t help. Thus began the 2 hour feeding shifts. I would feed her food and dilute 2% milk. She would eat and drink, then get in my arms and sleep. Cats will always clean themselves after eating, she didn’t start doing that until Friday afternoon. I showed her where the litter box was and she knew exactly what it was for. Makes me wonder if someone didn’t just throw her out. Friday night, I made the mistake of letting her go explore. I heard some noise in the kitchen and walked in to find her in the middle of the table eating the bread. I almost cried. I picked her up and gave her some more food which she quickly gobbled up. Needless to say, the starvation mode stayed on and it took us buying a clear container in which to store our bread and chips before we were able to keep her out of them. I was supposed to take her to the vet that Saturday. My daddy asked me to wait until the next Saturday (October 22), so I waited. All weekend, I fed her, snuggled her, showed her how to play, and she eased up on the starvation mode eating. She was eating but not picking up any weight. I took her to the vet that following Saturday, the vet said she was at least 6 months old. I started crying. She didn’t look a day over 5 or 6 weeks old. He wormed her and sent us on our way. The trip back home was horrible for all three of us – oh yeah, Maebelle wanted to ride, so she was with us. I’ll spare everyone the details. I just knew I was going to lose her to the worm treatment, but she finally pulled out of the slump she was in after the worming. My vet said he wanted to wait to chip, start her vaccinations and spade her. After dealing with the wormer, I’m afraid to do vaccinations, but I know she has to have them. She is still so very tiny, but last night I did let out her break-away collar just a bit. I’m not one to leave a collar on a cat, but until she gets chipped, she will wear her collar. She learned to use the doggie doors this past Friday, and is now going in and out at her discretion. I’m not really a cat lover. However, I think my maternal instinct kicked in and I’m so happy she chose to adopt us – or rather our trash, and well, we come with the trash. Laugh! Now, I just pray she doesn’t come in heat until I can get her spade. She’s still so small, I doubt my vet will want to attempt any kind of surgery, including chipping her, until she has more weight on her. She’s still boney, but she is a live wire. She has run both of the big cats out of the house, and the dogs ease into a room to see if she’s lying in wait to jump on them. It’s so funny. One of our cats has decided enough is enough, she’s coming back in, and she’ll now stand her ground (roflmbo!). This would normally annoy me, but just to see her play, makes me smile. Jesus sent her to us and as long as I have breath in me, I’ll always care for her. She’ll never have to hunt for food, although I know she will. Chuca and Chuita were too close to my late Samson’s nickname, Chuey, and my momma asked me to name her something she could say, lol. Now, for her unveiling: Lady Gigi!!!!!!!!!! I hope everyone had a wonderful Thanksgiving. We had everyone except one of my sister’s and her husband (he has the flu…he should’ve gotten the flu shot!). I made sure I stayed busy; however, all I could think about was my Sam. I know I can’t have him back, but if I could, I would wish him back to me in a heart beat! He loved the scraps, the vanilla wafers from the banana pudding, and my momma’s dressing. All I could do was cry! I didn’t like holidays before he passed away, and I sure don’t like them with him gone. The second holiday without him. Sooner or later I’m sure I’ll stop crying, but for now…now I don’t even try to stop. A picture my mom found of him. His pawpaw gave him a skunk and he loved that skunk! Last Tuesday night, as I was taking Maebelle out for her nightly constitutional, a black cat bailed off of our porch, ran to the gate and sat there looking at me. I tried to call him to me to no avail. Maebelle and I went back to bed. When I came in the door Wednesday after work, my mother said “be real careful when you go on the porch there’s a kitten out there”. I knew it was my cat from Tuesday night. 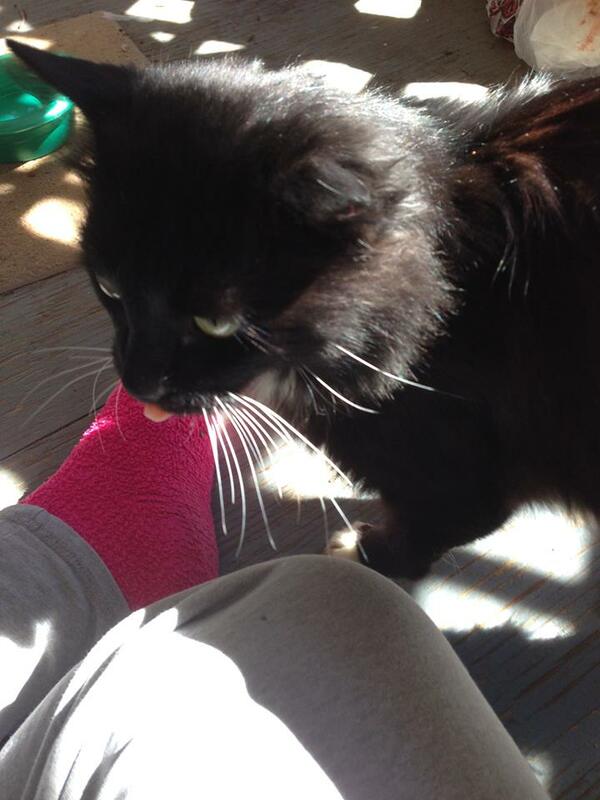 I eased outside, sat on the porch and he walked up talking and kneading. I put my hand on him to rub and his motor kicked in. That was it, it was over, I was in love. Now mind you, I DO NOT like cats, especially sow cats because they don’t love you, they are fickle. Toms on the other hand, the more love the better. I went back inside, opened a can of wet dog food (all I had) and he almost took my hand off, he was starving. Literally, I could rub down his back, count every vertebrae and count every rib. And his fur wasn’t soft and kind like well kept cats are. I loved on him some more, made him a bed and went off to bed myself. I was so excited when I woke up Thursday. I fed the inside dogs, got the cat some thing to eat and walked on the porch and no cat. He had gotten sick during the night. I called him and he didn’t come. I took the food in and asked my mother if she’d feed him if she saw him. She called me later that morning and told me he’d come up and ate. 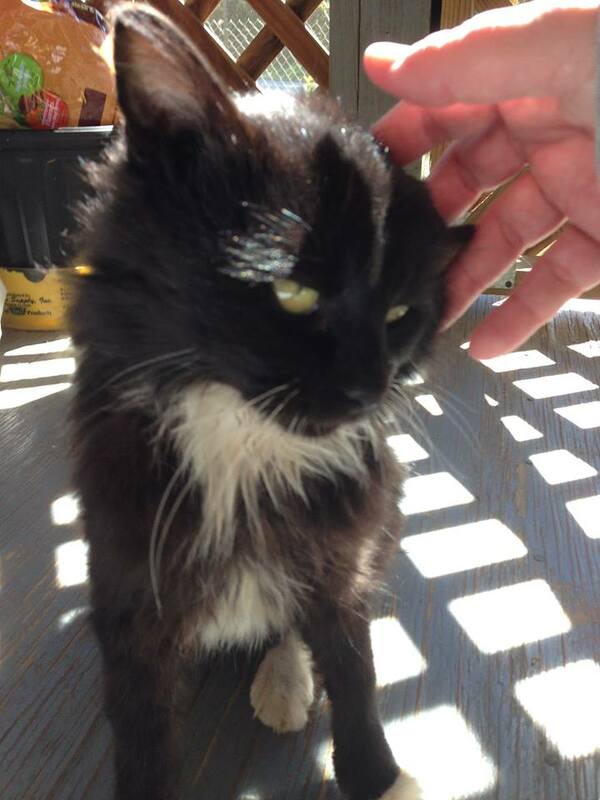 I got home Thursday night, same dance, I loved on him, fed him and then I named him…Riddick. We went through a few names until he looked at me when I said Riddick, so there you have it. A cat with a name. We went to bed Thursday night, Friday morning, no Riddick and he’d gotten sick, again. Saturday, I put him in the pet taxi, which he walked into without any problems, and off to the vet we went. Turns out, Riddick, is about four or five years old and wormy (duh!!!). 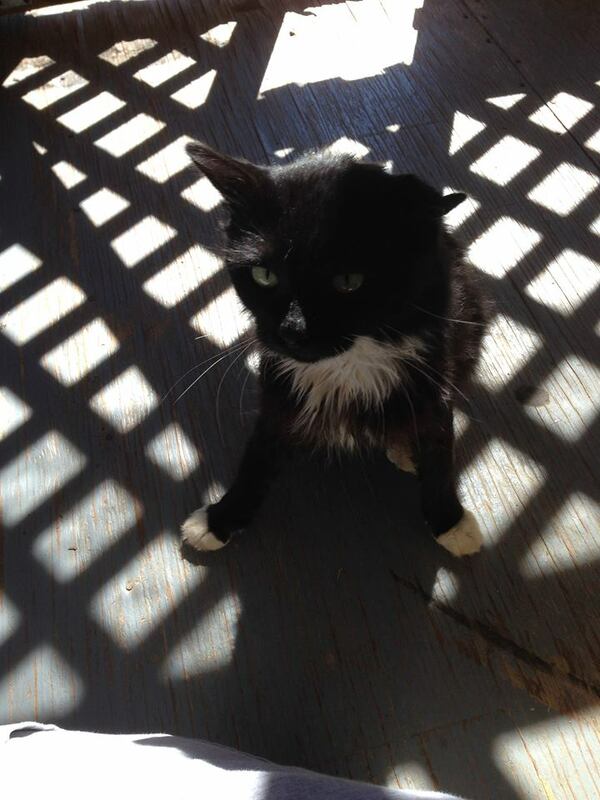 He had his blood drawn – negative for feline leukemia and aids – woohoo! And Dr. Chip clipped his nails which were sharp, trust me, he likes to knead on you as you pet him. I had some very short errands to run before going home, he never cried the first time (my sister was in the car with him, I NEVER leave my animals in the car, EVER!). We made it home, he came out, I fed him and loved on him. By that afternoon, I just knew I was going to loose him. He was so sick from the worm medicine. I went to bed and cried because I just knew I’d killed him. He was too frail and underfed for a wormer that strong. Sunday morning couldn’t get here fast enough. He’d gotten sick, again, and was gone. I called and called and nothing. I walked back in and told the parents I knew better than to let him be wormed until he had more meat on him. Just as I was getting ready for church, Momma walked in and said Riddick is on the front porch ready for his food. I dressed as fast as I could (which isn’t fast in the mornings, as I’m so stiff). I grabbed his food, I had it all ready, walked out on the porch and there he was, talking, kneading and rubbing up against me. I fed him. After he ate, I picked him up and rubbed and he purred and he has my heart for sure. (Not Samson’s part, but a piece which Samson left behind.) After church, I fed him a little more, and continued that through out the day. He never got sick. Last night, I fed him, loved on him, we had our little talk (he’s an excellent listener, like Samson was) and I was in for the night. This morning when I got up and took Maebelle out, he jumped off the swing. I picked him up, loved on him, and went back inside and fixed his food. I fed the dogs, took him his food and rubbed him down the back, he felt like a different cat. I’m not sure a wormer is supposed to work that fast, but he feels different. And he wasn’t sick!!!!!! Riddick 1, worms 0!!!!! I was supposed to take him in today for a neutering, but he was so very sick Saturday that I think I owed it to him to give him a week before I cause more pain to be inflicted on him. Next Monday, he’s be fixed and vaccinated while he’s under. Some of his funnies, he will put his paws on you like a dog and stretch while you rub him down the back. If you start to walk away and he’s not finished loving, he will take his paws and grab your leg. He scared me the first time he did that. I know he used to belong to someone, he had to because he is so lovable. 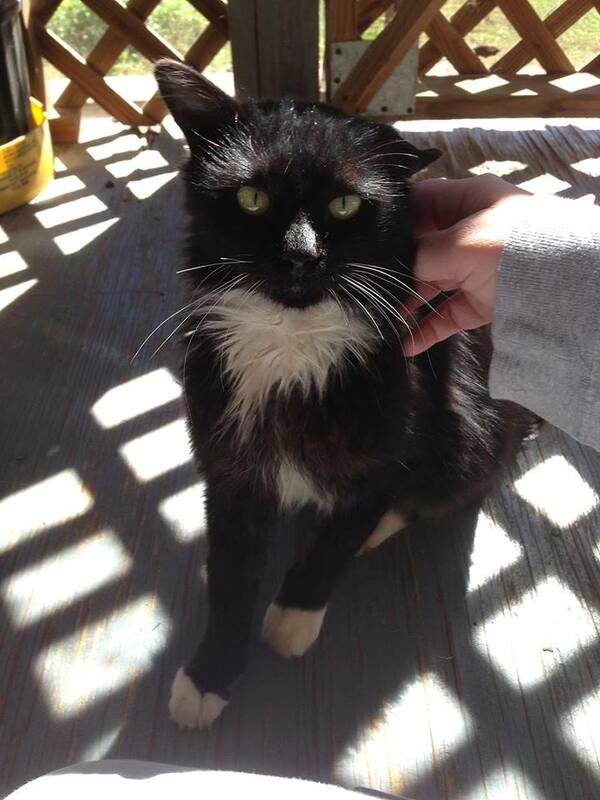 He’s crate trained and is an indoor/outdoor cat, although there is no indoor for him until he is fixed and vaccinated. Then we’ll see if we can transition him inside/outside like our other two sow cats (who DO NOT like him, he has the front porch to himself, neh!). I know I shouldn’t fall so hard for a Tom cat because we’ve had our fair share and they’ve all met their ends in the road (I’m hoping and praying the fence will be a detriment), lost a fight to a younger Tom, or failed to out round the wild dogs on our hill. Either way, I will love Riddick while I have him. I will see that he’s fed and never has to worry about his next meal. I will keep him wormed and vaccinated, so he doesn’t have to worry about being sick. And when his last day on Earth comes, I hope I’ve given him all the love he can handle. Maebelle is the only child I have left. She is pampered unlike no diva dog I’ve ever met. Set-up: My momma (she baby sits for me) was outside. She noticed Bella (aka Maebelle) wasn’t outside with her, so she goes inside to find her. When she finds her, she is laying in Teddy’s (go read the Pack page) spot with her back to Momma. Momma called her, she turned around and hopped to her with her back right leg up. Momma’s call to me: Sister something is wrong with Bella’s right leg. She is holding it up. We are on our way to the vet with her. I’m sorry she was in the house and I was outside. My reply: Momma, you’re not to blame. Maybe she tried to jump on your bed and missed, or fell off of the bed. Do I need to meet you guys at the vet? Momma: No, I’ll call you and let you know. So it was a sit and wait game, which I DO NOT do well. My phone rings, it’s my daddy. I immediately prepare myself for something bad. My daddy never calls! Daddy: Sister, she’s gonna be okay, here talk with the doctor. My doctor: She’s okay, nothings broken. She either sprang her leg/ankle, or she was bitten by a wasp or something like that because she had a red streak running up her little ankle. I’ll give her a steroid shot, and send some home with your parents. She should be just fine. Hmmm, I never trust anyone when they tell me my child will be just fine. Just because she’s the only one left. The rest of the afternoon, a whole hour, the clock crawled around to 5pm. I drove home as fast as I could, jumped out, and walked in the house and there was bouncing Bella. Jumping, whining, waiting for me to pick her up. If she had been a child, I would’ve spanked her! The nerve! I was so freakin’ worried and there she was doing donuts waiting for me to pick her up. I picked her up and loved on her. When I put her down, she walked a few paces, turned, looked at me then held up her back leg. I caved, as I always do. I picked her up, carried her around outside for a while, then sat down to knit with her wrapped in her binkie beside me. Only then I couldn’t concentrate to knit. My brain was in overdrive from my momma’s frantic call to me. I tried watching a bit of tv, nothing. I finally gave up, at the suggestion of a friend whom I was texting. I closed my eyes and the next thing I remember was my head falling forward. It was very early, but I didn’t care, I took the pups out for their nightly constitutionals, and Bella and I went to bed. Sleep was easy to find after I’d spent so my brain energy of the diva! This morning, she was up, limping a little bit, but no worse for the wear. I told her to stop jumping on beds. She knows better. She has a couch and a recliner to lay on, the beds are off limits. My daddy put up a ‘doggy fence’ to keep her out of their room when they are outside, laugh. I got the feeling Daddy didn’t want another ’emergency’. I love my Bella and would go to the end of the Earth for her if it meant she’d be well. All pet owners (and non-pet owners), remember, when you are away from the house, your inside animals will go where you’ve trained them not to only because they can. If there’s a room/area you don’t want them in, just put up a doggy fence. LIfe is never dull with Maebelle! 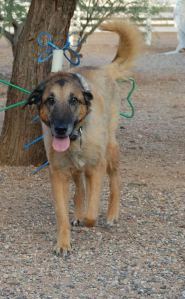 Calling all dog lovers/owners, we have a senior dog who needs to find her fur-ever home. She needs to be the only dog. She isn’t aggressive, she just doesn’t seem to fit into ‘packs’. She’s a loner, so all you loners out there, give Gertie a look-see and let’s give her the love she obviously didn’t get before arriving at Run A Muck Ranch. Yup, Gertie is still here. The few people who called on the fliers I posted didn’t read them very well, and discussion of Gert’s age was the deal breaker for some. Those who weren’t concerned about her age didn’t read the part about her being a house dog. That the interested parties intended to keep Gertie outside was a deal breaker for me. Sweet Gertie, still sporting the bad haircut. 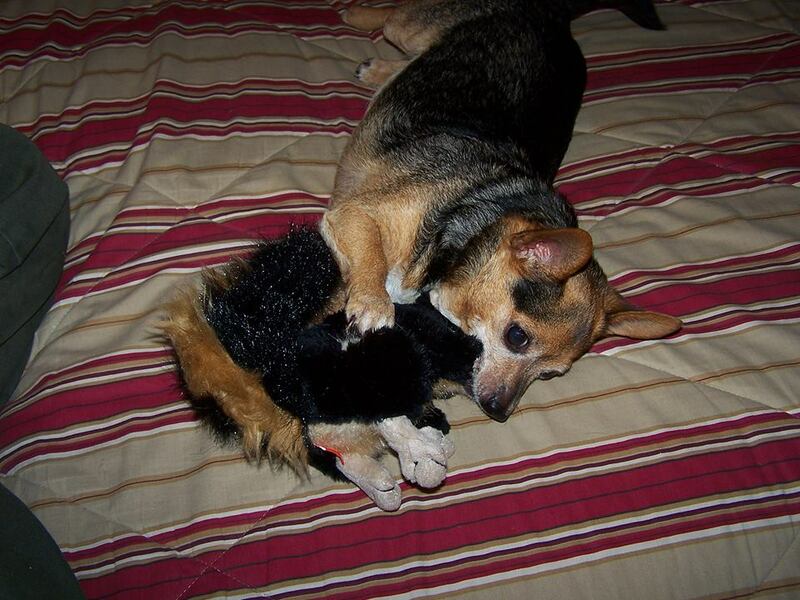 A rescue did eventually list Gertie on their web site, but her bio was cut off mid sentence. Hey, she’s listed though! A no-kill shelter offered to take her but we declined. An old lady needs to be in a home, not a kennel.